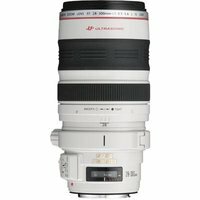 The Canon EF 28-300mm f3.5-5.6 L IS USM Lens is an ultra-high 10.7x zoom range covering everything from wide-angle to super-telephoto, Canon's latest professional series 'white lens' is designed for professional photographers looking to limit lens changes and overall kit weight. With Image Stabilisation (IS) and high speed, silent auto focus, this superbly specified lens delivers what others can only imagine. Includes Canon ET-83GD lens hood.